sculptural yet functional way. It is composed of sections held together by keys. As these sections are put together the shelving is seen to continue in one flowing movement and the height of the piece can be determined by the amount of sections used. The whole unit is constructed on a revolving base, so that the case can be rotated in either direction giving easy access to the books displayed. 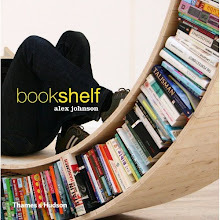 The books are held in position by spacers, which snap onto the inside edge of the shelving. That is a unique bookshelf! It looks very modern, nice. wow what an idea about spiral shelving , the benefit which we get from this kind of shelving is revolving direction and user friendly to pick any collection. I love this idea! Where do they sell these? 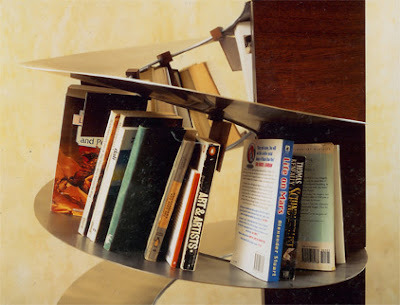 Here is another idea of a spiral bookshelf...need to figure out where to find this one too!